He was working so hard and he had earphones on to protect his ears, he didn’t notice Trump coming up to him to surprise him. 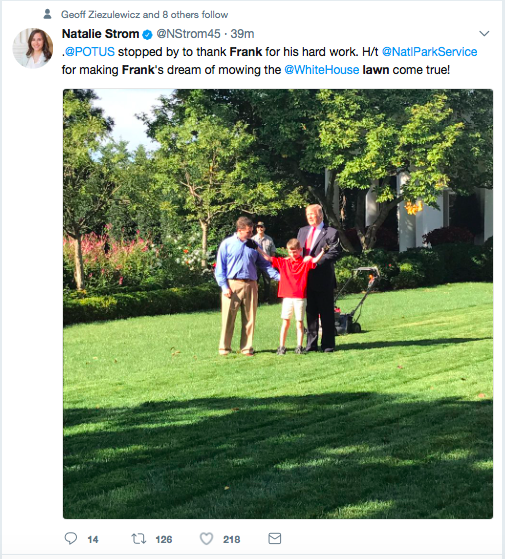 Eleven-year-old yard services entrepreneur Frank Giaccio locked down his biggest client ever Friday morning, mowing the White House lawn on the invitation of President Trump. White House Press Secretary Sarah Sanders tweeted a photo of Giaccio taking care of business Friday morning. “Frank is hard at work in the Rose Garden and doing a great job!” she wrote. 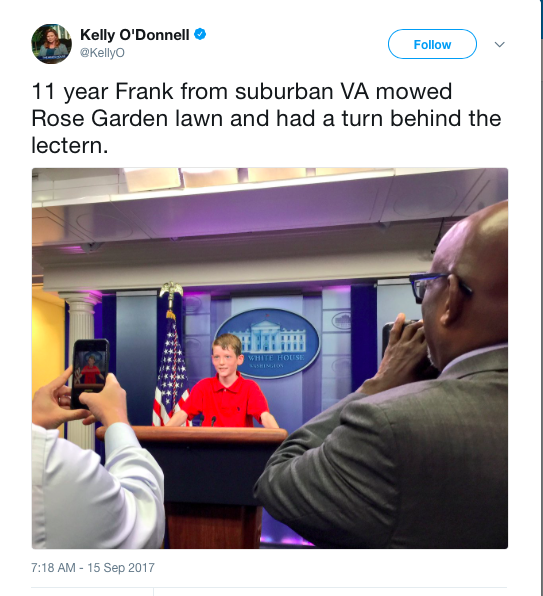 Sanders announced earlier this week that “Frank from Falls Church, Virginia” would help the grounds crew cut the Rose Garden grass. Trump accepted the Virginia boy’s offer after he wrote to the president saying it would be his “honor to mow the White House lawn.” Giaccio, who was 10 when he wrote the letter but has since turned 11, also enclosed a menu of his services, which include weed-whacking. The White House later tweeted a photo of Trump walking alongside Giaccio on the lawn. He even got a turn behind the lectern.